I started wearing glasses when I was in middle school. My parents asked me one day if I could read a sign on the outgoing mail box from where we were sitting in our car. I said “no.” Horrified, they immediately blamed it on the Game Boy that I had spent far too much time playing. I realized in that moment that I would probably never play Game Boy again. I was right. In the following months, I found myself going to the eye doctor and receiving my first pair of prescription glasses. I hated them, and I hated the fact that I could no longer play video games. The 12-year-old me couldn’t see how becoming near-sighted could ever give me any advantages in life. Most people would probably agree. How could seeing life as a giant blur help in any way? It may sound strange, but seeing without focusing on one particular thing in front of me has helped in many ways. Think of standing in front of an audience of 75 people. They’re all staring at you, waiting for you to give a presentation. Your palms are sweating and your stomach is turning. You see everyone’s expressions and reactions to whatever it is that you’re saying. That’s what it felt like when I wore glasses. Now imagine blocks of tans, reds, blues and grays moving slightly back and forth. They are the people you are presenting to. They have no faces, no expressions, no visual reactions. That is what it’s like what I see without visual aids. I don’t get nervous. I remember my speech and go through the presentation without a hitch. Not that this is helpful in every scenario (especially for ones where you need to see other people’s faces), but it has in fact made me lose any fear of speaking in public. See, after I conditioned myself to stop worrying about the people out there and worry more about the content that I was about to present, I could start using visual aids again. After a while, I just stopped getting nervous altogether, even when I would be wearing glasses or contacts. 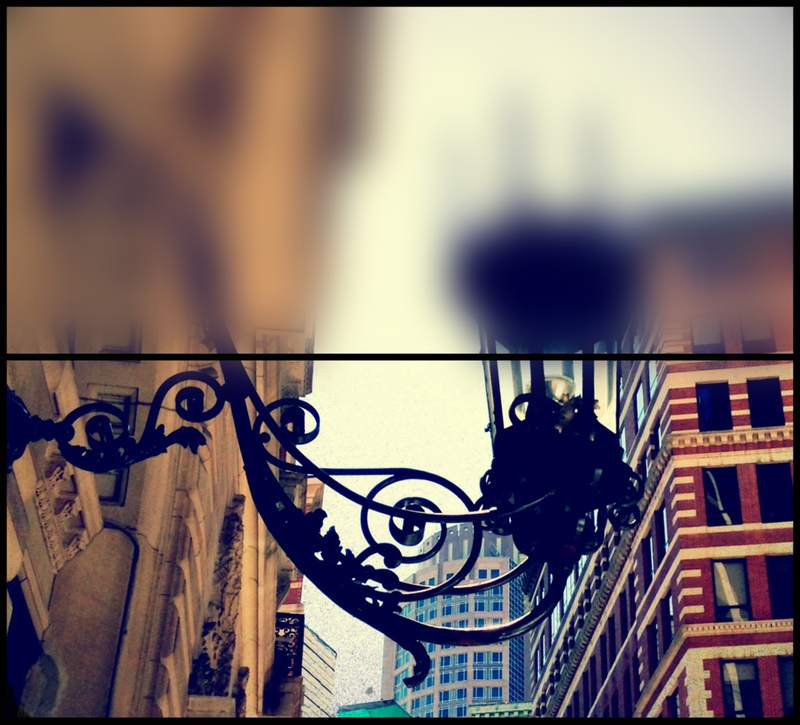 Now think about this: instead of seeing the big picture, you only see the small things directly in front of you. Your brain stops focusing on the things far away and only focuses on step no. 1. What’s so great about this? Well, it turns out it makes me think about step no. 1 not only in physical space but also in mental space. Say my room is a complete mess. Everything is in disarray, and I just can’t get started, because it seems like such a huge task. But then I remove my contacts, and instead of seeing the large amounts of clothing I have to organize, I only see the first piece of clothing in front of me that I have to pick up. Seeing that first step is a way for me to keep going little by little until I finish my task. But after running without contacts once, I realized something. It was that I could concentrate more on running, because my brain wasn’t receiving visual input that could be translated into additional thoughts that could distract me. I didn’t see the advertisements on the streets, the birds on the sidewalk, the little things that might stop me from focusing on breathing and going forward. I was purely concentrated on the one activity that I was doing. Seeing without focusing isn’t something that works for everyone. It works for me, because I’ve learned to use it in a positive way that helps me get better at certain things. Once I’ve gotten better at them, I can go back to seeing and focusing. It’s a conditioning technique that has come out of a flaw that I once hated. If I had told the 12-year-old me that losing 20/20 would have some benefits, I probably wouldn’t have believed myself. You might still not believe me either. But I’ve found something that I can use in order to do things that I might not otherwise want to do. I’ve made myself see a glass that’s more than half full, even if in reality it’s less than half empty. Thought-provoking design content. 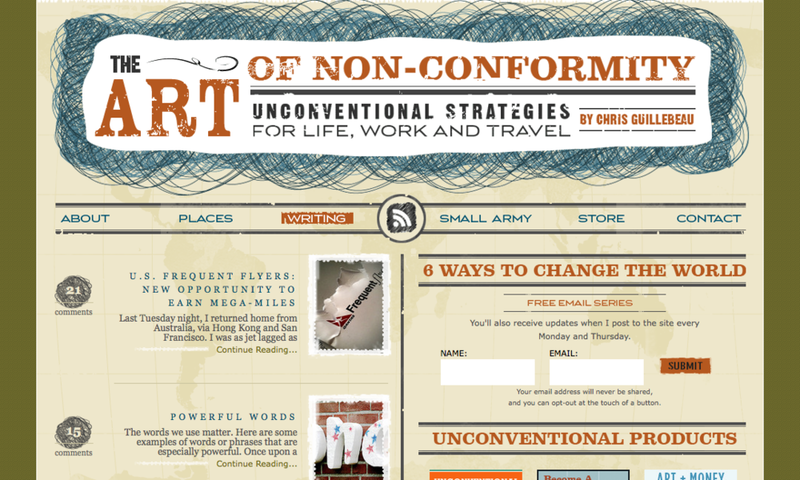 Use your keyboard arrows to navigate the site, which scrolls horizontally instead of vertically. 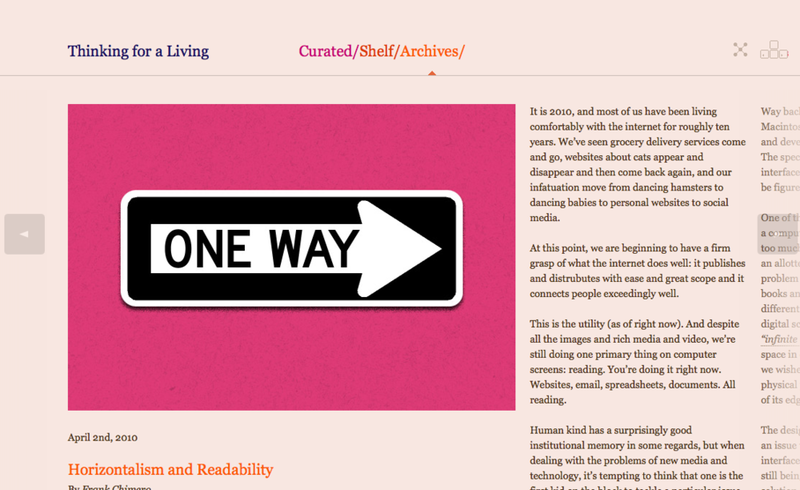 I really enjoy their article on Horizontalism and Readability, which delves into the history of scrolling and why scrolling horizontally might actually make sense in some cases. 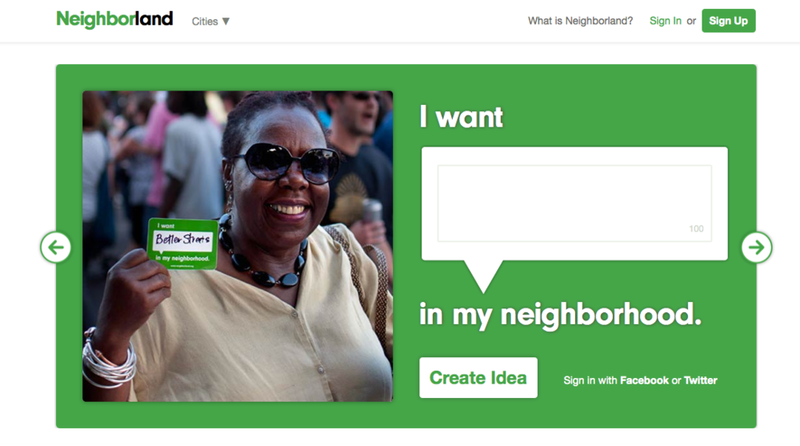 A great way for people to voice their ideas on what their neighborhoods need and how they can be improved. It’s a powerful tool if used well. If you haven’t heard of Chris Guillebeau, well…he’s kind of awesome. He’s visited 189 out of 193 countries, and he’ll have been to every country in the world very, very soon. He’s also a writer, a blogger and an influential guy when it comes to living an unconventional life. I love what he’s about.